Ezi Solution Systems creates easy to use, robust and affordable business solutions with no hidden extras. We have more than 20 years experience in the PC software market. We provide software that meets the needs of our customers at low prices. Users of our software are located in most parts of the world. We have resellers in more than 50 countries. Version 2.5 of Retail Man POS and Ezi Accounting were released in August 2017. This was the first major update in almost 2.5 years! A new licence key is required before Version 2.5 can be used. Ezi Signage for Digital Signage solutions that can be used by retail outlets, schools, colleges, companies, transport facilities to give customers information on products, updates on news, weather or traffic. Present a mixture of static and dynamic content. Upload and verify content remotely with the Cloud based solution. Free full function evaluation for 30 days. 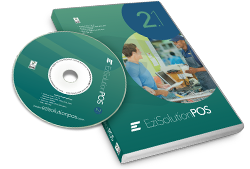 Download Ezi Solution POS, the powerful, scalable and highly available Point of Sale system. Includes the POS and Accounting features of Retail Man POS but with a local database for each POS station. Larger tables are partitioned, increasing capacity and performance. Download Retail Man POS to convert a computer into a powerful Point of Sale (POS) system. Most standard POS hardware (bar code reader, docket printer, pole display, cash drawer, touch screen, scales) are supported. Includes all the features of Ezi Accounting. Download Ezi Accounting, the low cost accounts package for small to medium sized businesses. Includes invoicing, stock control, purchasing and accounts. Integration with Web Stores is included. Cost effective and flexible solutions for Digital Signage, with Media Players on Windows or Android. No specialist hardware is needed apart from the displays. Most standard media formats are supported, including video, images, live web sites. Buy Accounting, POS or Signage software, upgrades or support from Ezi Sales, @ccounting or MyCommerce.